ความสูง : 70 1/4 นิ้ว/178 ซม. SOUNDBOARD กว้าง : 19 1/2 นิ้ว/50 ซม. 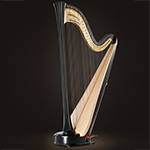 A contemporary harp designed by Lyon & Healy in 1985, the Style 85 is marked by its pure elegance and its affordability. Subtle in design, but equal in quality of sound and craftsmanship to other Lyon & Healy harps, the Style 85's ornamentation is sparse, bringing focus to its fluted Hard Maple column, the fluid curves in the base and showcasing the classic harmonic outline of the harp. The Sitka Spruce soundboard is decorated with a beautiful climbing vine while the solid brass action plates feature restrained decoration. 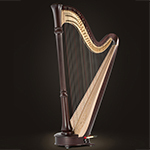 Available in natural, mahogany and ebony finishes, the Style 85 series harps come with a cover and a tuning key. The Concertino Grand comes with a 5-year limited warranty. ความกว้าง : 41 1/2 นิ้ว/105 ซม. A contemporary harp designed by Lyon & Healy in 1985, the Style 85 is marked by its pure elegance and its affordability. Subtle in design, but equal in quality of sound and craftsmanship to other Lyon & Healy harps, the Style 85's ornamentation is sparse, bringing focus to its fluted Hard Maple column, the fluid curves in the base and showcasing the classic harmonic outline of the harp. The Sitka Spruce soundboard is decorated with a beautiful climbing vine while the solid brass action plates feature restrained decoration. 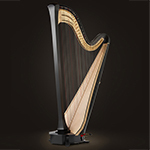 Available in natural, mahogany and ebony finishes, the Style 85 series harps come with a cover and a tuning key. The Concert Grand comes with a 5-year limited warranty. ความสูง : 71 3/4 นิ้ว/182 ซม. ความกว้าง : 39 1/2 นิ้ว/100 ซม. SOUNDBOARD กว้าง : 19 3/4 นิ้ว/50 ซม. Created in 1918 by Lyon & Healy, the Style 17 is a traditionally designed harp which features the elements and style reminiscent of the French Renaissance. The elegant organic detail hand-carved into the top and bottom of the Hard Maple column is highly decorative but airy and legible - similar to the extraordinary illustration seen in Parisian books of the sixteenth century. Delicate bronze and gold decoration on the extended Sitka Spruce soundboard enhances the design of the column and base. The Style 17 features solid brass action plates with richly illustrated script. The Style 17 is available in natural and walnut finishes and comes with a cover, tuning key and a 5-year limited warranty. Created by Lyon & Healy in 1890, this complex harp is symbolic of the Victorian era during which it was first made. The Style 23 has become the most recognized harp in the world and showcases the woodworking artistry of the Lyon & Healy craftspeople. Its sound is unmistakable: even, responsive and resonant. The highly embellished floral carving at the crown, top of the column, base and feet, is coupled with a fleur de lis pattern at the bottom of the column - both were notable features of the time. Sweeping organic gold leaf decoration accents the extended Sitka Spruce soundboard, which also features a double Rosewood inlay along the edges. The Style 23 features solid brass action plates with richly stylized lettering and ornamentation. The Style 23 is available in natural and walnut finishes and comes with a cover, tuning key and a 5-year limited warranty.